Medusa wasn’t eating or drinking well. We thought she was just tired from several consecutive 24 miles runs. After a week of rest, she still wasn’t eating or drinking well and Greg noted her hunched back, so we brought her to the local vet. We suspected either a back injury or obstructive bowel– although if it was the latter we didn’t know what she could have gotten hold of. The vet took blood work and ex-rays. The blood work came up with abnormal white blood cells and a high UREA (?) level. The ex-rays were sent out to a radiologist. We were extremely surprised to hear that the problem Medusa has is hip dysplasia with DJD (degenerative joint disease). We got Medusa, Siren, and Kraken when they were around three months old (they are now 5.5yrs old). They come from Mackey/Forsberg lines. The plan was for all three of them to be on my CB 300 and YQ 300 team in 2014– they would be around 1 year and 4 months old. Siren is the only one who made the cut. Kraken had, and has had all his life, chronic diarrhea; and Medusa just wasn’t very enthusiastic– she didn’t have the drive like her sister Siren did. I wonder if the problem all along was hip dysplasia. According to the vet, the abnormal blood work doesn’t have anything to do with her hip dysplasia. He’s guessing the abnormal white blood cells has to do with worms (we found roundworm in Jack’s poo, so we’re worming all of the dogs. Strongid every ten days, 4 times). We’ve put Medusa on 2.5mg of meloxicam 1X a day. 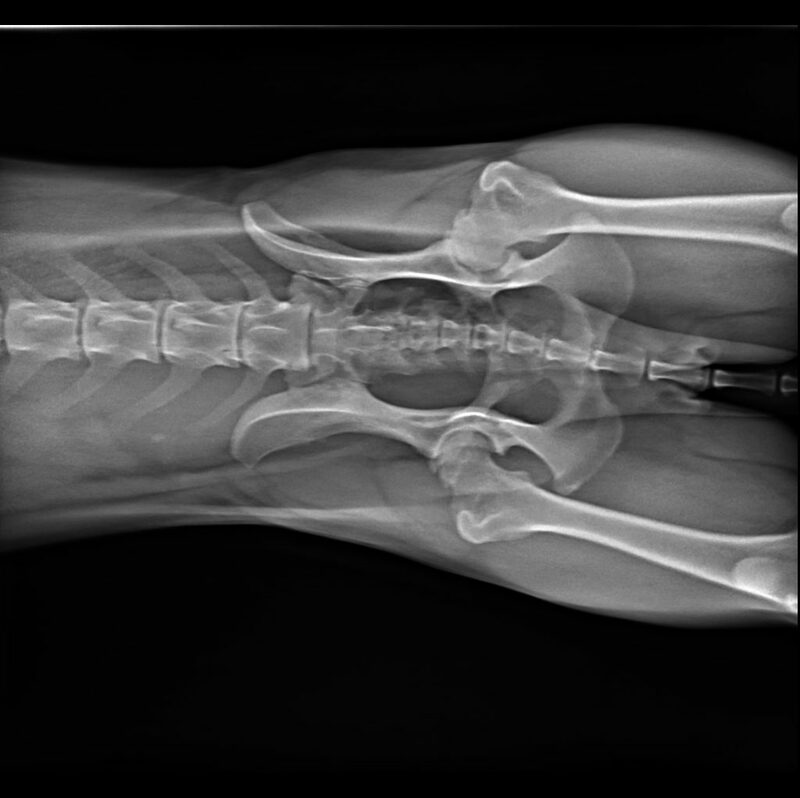 The vet told us that eventually, more sooner than later, her left leg will break or come loose from the socket and that he can do surgery once this happens. We’re really sad that Medusa will no longer be a sled dog because she liked to go and was a core member of the team.